Sometimes it helps to write on adapted paper so that you have a strong visual representation of where to write. Different types of paper is helpful in different situations. This download includes 19 pages of paper, and includes plain, yellow highlighted, grey, and dirt – grass – sky paper. Each type of paper comes both wide ruled and skinny ruled, and two to a page so that you can have the option of using only half a page. 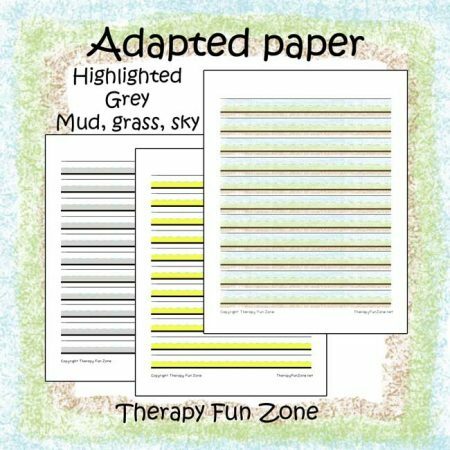 The grey, highlighted and plain versions have a page with letter dividers for work on spacing.